A feast day celebrating the birth of John the Baptist is not the only Italian tradition to take place on June 24—every year on San Giovanni, Italians gather unripe, green walnuts to infuse in a neutral spirit for homemade nocino. Delicately nutty and subtly spiced, this traditional liqueur is perfect paired after a rich meal with custard-based desserts like crème caramel. And while every recipe varies slightly—some use more sugar, others introduce additional spices like cloves and cardamom—Erik Ellestad, former San Francisco bartender, encourages experimenting with flavors at different stages to find the combination of spice and sweetness that suites your tastes. You can also experiment with resting times, as nocino mellows with age. Ellestad flavors the syrup used to sweeten the liqueur with cinnamon and citrus, allowing the flavor of the green walnuts to shine. 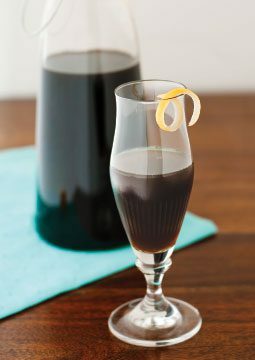 Try it in this delicately nuanced Matrimony Cocktail, which blends nocino with genever and dry vermouth. Step 1: Quarter 16 green walnuts. Place the walnuts and the zest of 1 lemon in a clean, sealable glass jar. Cover with a 750 ml. bottle of vodka. Steep for at least 40 days in a cool, dark place. Step 2: After 40 days, combine ½ cup of water, 1 cup of sugar and 1 cinnamon stick in a saucepan. Cook over low heat until sugar dissolves. Cool and remove the cinnamon stick. Step 3: Strain the walnuts and lemon peel out of the vodka. Combine with the cinnamon-flavored syrup. Let rest for 40 more days. Step 4: After 40 days, strain through a chinois into a clean glass bottle. Note: Green walnuts can be purchased online or from local farmers or grocers while in season (June through August, depending on where you live).